downtown Davenport as river rises to 3 feet over flood stage. 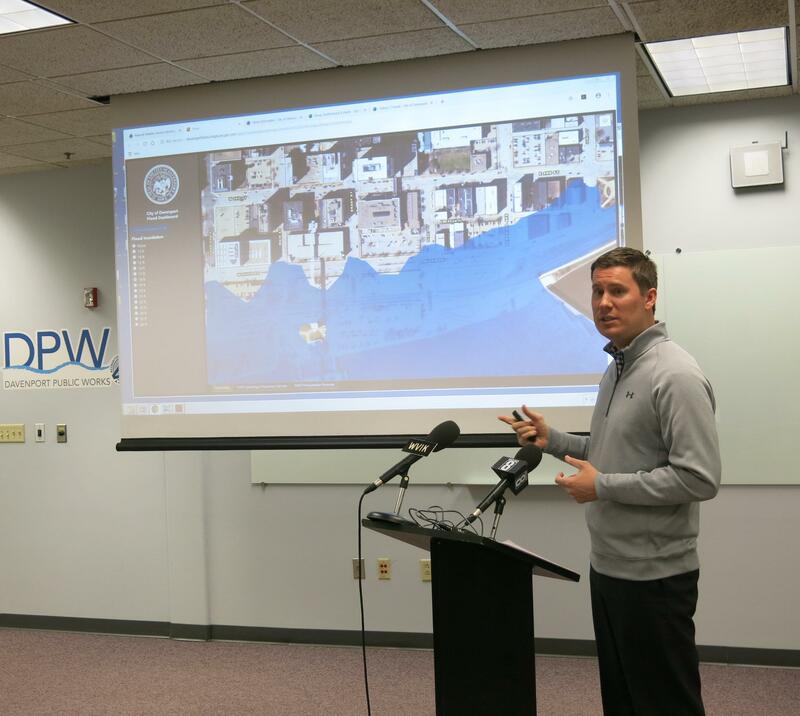 Davenport's Capital Manager, Clay Merritt, briefing reporters on the city's flood preparations. Flood preparations are well underway in Davenport as the Mississippi River continues to rise. As of Friday, the floodwall is up around Modern Woodman Park, Credit Island is closed, and River Drive through downtown is closed. Capital Manager Clay Merritt says they have a good idea how high the river will go for the next few days, but not much beyond that. "What we know for sure is that 18.4-foot level that the National Weather Service is predicting. Out into the future it's kind of hard to see because those probabilities go up and down but they're looking like it will maintain for the next week or so at least at that 18-foot level." That's about 3 - 3 1/2 feet over flood stage from Sunday through Tuesday, and perhaps longer. The possibility of the river going higher is pretty high this spring, but Merritt says there are still a lot of variables to consider before the final crest occurs, whenever that might be.